Even with over 43 quintillion possible solutions to completing a simple 3×3 Rubik’s Cube, a majority of people have yet to solve one of the world’s most iconic, challenging puzzles. 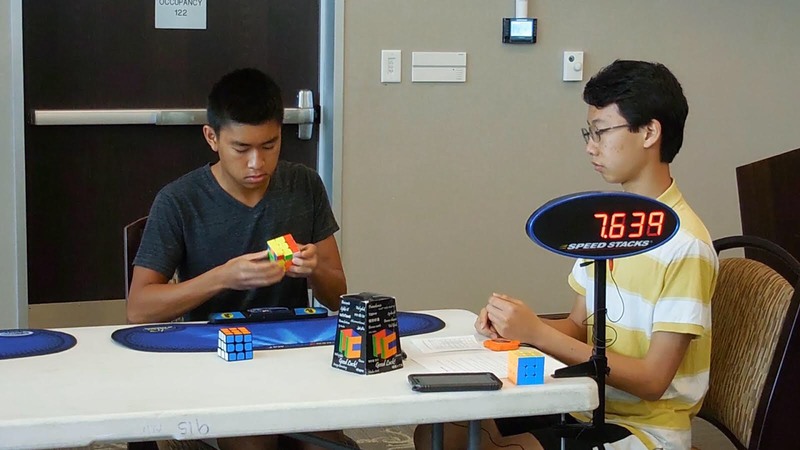 However, for eleventh-grader Edison Ooi, completing a Rubik’s Cube is simple when you have an average solve-time of 11 seconds and have participated in a total of 10 competitions throughout Florida and in Malaysia. As the founder and president of Pine View’s Rubik’s Cube club, Ooi continues to display his skill and speed in puzzle-solving through his dedication to completing Rubik’s Cubes, as well as being an active participant in competitions. Ooi began learning how to solve Rubik’s Cubes four years ago when his friend introduced him to the iconic game. Watching YouTube tutorials on how to solve a 3×3 Rubik’s Cube, Ooi quickly discovered the trick to completing the puzzle and eventually mastered it. He then moved on to learn how to solve 2×2, 4×4 and 5×5 cubes. As of right now, Ooi’s fastest times include seven seconds for the 3×3, 49 seconds for the 4×4 and about 90 seconds for the 5×5. It wasn’t long after his mastery that Ooi decided to participate in various Rubik’s Cube competitions held by the World Cube Association, the worldwide organization that regulates and holds competitions for mechanical puzzles that are operated by twisting groups of pieces. Ooi has thus far competed in nearly 10 events, most of which are held in Orlando, Fla. and average around 60 to 80 competitors, most of whom are under 18 years old. In 2015, Ooi placed top in the state for solving a Skewb cube, a similar puzzle to the Rubik’s Cube. In the same year, he also placed as one of the top three competitors for solving a 2×2 Rubik’s Cube. In the future, Ooi plans to continue to participate in Rubik’s Cube competitions and to gradually decrease the time it takes to solving cubes. He also hopes to continue to expand Rubik’s Cube club and possibly host his own competition at Pine View through the World Cube Association. Rubik’s Cube club meets every Monday at 1:20 in Room 125.